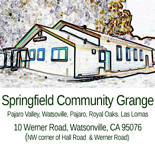 The Springfield Community Grange, in collaboration with Las Estrellitas de Esperanza, a local baile folklorico (Mexican folk dance) group are excited to present a live performance of Son Jarocho style music and dance by Maestro Andres Flores Rosas and Los Hijos de Jose. The performance will take place on Friday, September 21, from 7 to 9 PM. Visitors who arrive at 7 will receive a basic zapateado (step dance) workshop from el Maestro. Son Jarocho is a musical style from the Mexican state of Veracruz. See Maestro Andres in action in the video clip below. We hope you will join us for what will be a very special and memorable event. It is an honor to have el Maestro with us in the Pajaro Valley all the way from Veracruz! Maestro Andres Flores Rosas plays “La Manta” during a visit to San Francisco. This entry was posted on September 19, 2012 by dveraisaxton in Events, News.